Whoa hoooooe this is the best news I have heard all week!!! Thanks a bundle!!! How long have you known about this and not told me??? Don't I rate some kind of preference?! This is awesome! I could have used it Thursday, if I had had a spare minute to check the blog. Thanks! That's awesome information. Does that mean I don't have to read "Photoshop for Dummies" now? Wow, this is good news. I've tested it already en it works great! Super-eays to use en it makes gorgeous pictures. THANKS!!!!!!!!!!!!! HURAHH! THREE CHEERS FOR JESSICA FOR FINDING THIS AWESOME THING!!!! That's really cool, thanks for sharing. But I miss something essential: contrast. Thanks for sharing this, I just created an account! Thank you for this. I have just been lamenting not having photoshop!! I love this, I've been using the only thing we had, the Microsoft Picture Editor. Thank you SOOOO much for sharing!!! Thank you, thank you! I just received a mini tablet as a gift and have spent hours looking for a site like this. Not sure how I missed it, but so glad you shared! Thanks again! Thank you so much for posting about this - Just what I need!! This is really great news. Thanks for sharing. 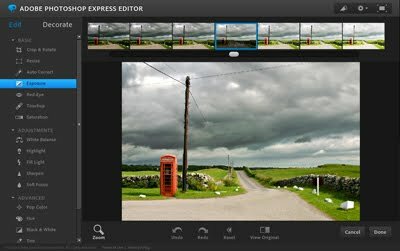 I really Love the Photoshop Express editor, I would like to add one more to your list which has some better option of editing features, It is also one of the Best Photoshop Online Free Editor which is same like pixlr if you have heard. The most i like about the editor it's automatic ready made option to apply directly on the pics, Do check out it's GIF template also.